This set is actually rather more than just elites as suggested by the title. Rather it is something of a tidying up of various loose ends for the HaT 1806 Prussian range as well as elite figures. We will therefore deal with each element in this set separately. The first three figures in the top row and the first figure in the second row are Jägers. If the light infantry was seen as an elite then the Jägers were the elite of the lights, something akin to the 95th rifles in the British army. They were small in number (just one regiment in 1806) but carefully recruited from civilians already skilled in using firearms (hunters, gamekeepers etc). They often provided their own weapons, which were rifles rather than the smoothbore muskets of the infantry, and it is just such a soldier that is depicted on the box artwork. Their uniform, with its belly pouch and plumed hat, is entirely accurately done here. The poses are of two firing and two reloading - suggesting something of the common practice of these men working in pairs to cover each other, although they were still vulnerable due to the slow rate of reloading and usually kept close to formed bodies. The remaining two poses on the top row are of Schützen, which were a small number of picked men in each line company that were given rifles and performed light infantry duties. These wore the same uniform as the rest of the unit, but seem to have been given forks to improve their aim as modelled here. Again the uniforms and equipment are correctly done. 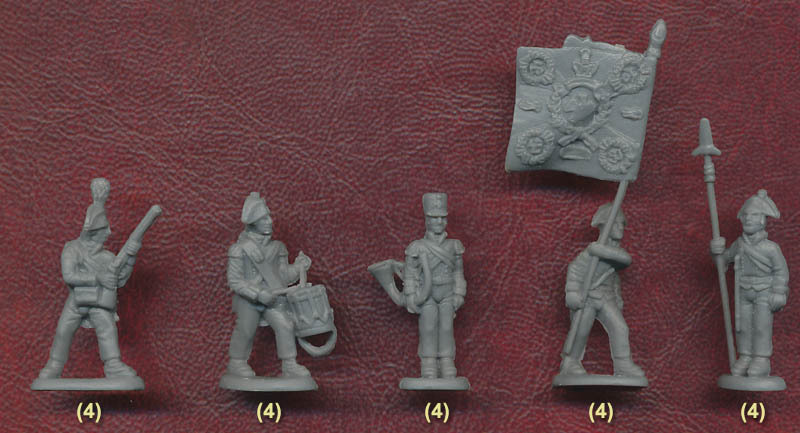 Finally we have some individual figures that really match previous HaT 1806 Prussian sets. The drummer is an addition to the Musketeers set, and blends with it quite well as the same style has been adopted. He has a good sized drum and the correct swallows' nests and sleeve lacing that were a sign of his profession. Next to him there is a fusilier with a bugle-horn for the set of Fusiliers, and again the match in style is good. The flagbearer goes with the Musketeers set but his construction is interesting. The flag and upper staff are a separate piece, slotting in to a hole by his left hand. This means the figure can be more easily fitted on the sprue, and it also gives the customer the choice of direction in which the flag is facing. This is a very simple yet very clever device which works well, despite the fact that the plastic used for the set is quite soft. This must have entailed some difficulties in producing the mould but the result is well worth it in our view. The flag itself is of a very good size and has been engraved on both sides with the standard pattern for infantry flags of the period. Finally we find a musketeer NCO with his spontoon and a cane attached to a button in classic style. He is motionless but appears to be barking out an order. The sculpting on these figures is much like that of previous sets in this series as we have said. The heads are quite large and the detail is not as sharp as it might be but it is all there. Some of the figures are a little flat, and there are a few niggles like the poorly formed musket fork on one figure, but there is no flash or excess plastic and because all the figures are only connected to the sprue through their base there is no problem with lost detail caused by feeds to the sprue. With faultless accuracy and complete compatibility with other sets this is a very much needed addition to the range. The Jägers had already been made by Esci but fully justify a remake, and the rest of the figures expand the collection very nicely. For those planning to recreate Jena or any of the other momentous events of that year this will be a required purchase.